Hello spring 2019! I’m celebrating with this new kitchari creation — think Italian rustic risotto with leafy greens, leek and lemon topped with a fresh garlicky pesto. 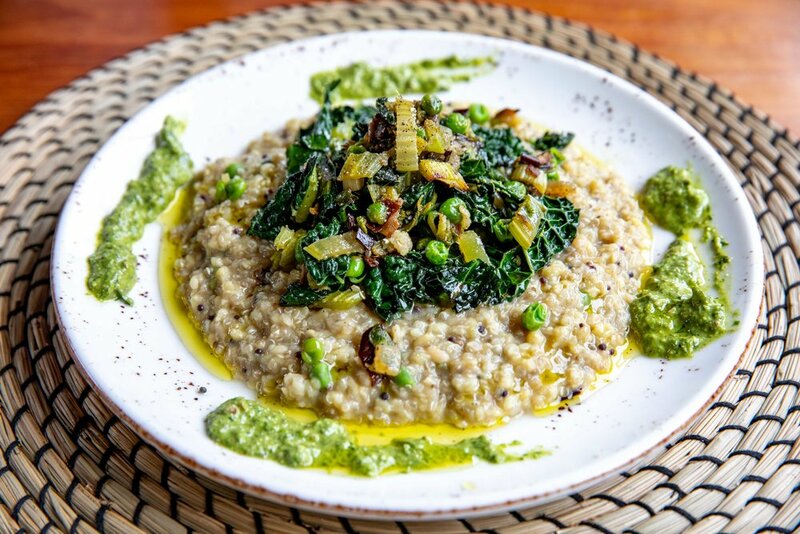 The risotto itself is actually based on the Ayurvedic classic kitchari but with a twist of its own: the rice is mixed with quinoa for a delicious nutty texture. If winter is all about warming spices and summer is all about cooking herbs, then this kitchari is the love child of both — which is what spring is all about. We’ve just celebrated the spring equinox, when the day is as long as the night, just as the balance tips in favour of the longer days of summer. This seasonal change is a great time to do a 3-day Cleanse + Reset — sign up here to get the link. Soak the quinoa overnight in double the amount of water. Heat the ghee or oil in a large pot. Add the mustard seeds and as soon as they begin to sizzle and splutter add the garam masala and sauté together on medium heat for a minute until fragrant. Stir in the mung dal and quinoa. Add the water and salt and bring to the boil. Reduce to a simmer and continue cooking, lid on, for another 30 minutes (longer if using whole green mung beans), or until the dal is completely soft (easily squashed between finger and thumb) and the kitchari has a porridge-like consistency. Stir occassionally and keep an eye on the water levels, then taste and adjust seasoning. Meanwhile, make the pesto. Put all the ingredients in the small bowl of a food processor with two tablespoons of water and season with salt and black pepper. Pulse a few times to to make a rough paste and set aside. To cook the spring greens, heat the ghee in a frying pan on a medium heat. Add the leek, celery, salt and pepper and sauté, stirring regularly, until gently caramelised and softened. Add the spring greens, peas and lemon zest and sauté for for 5 minutes or longer until the cavolo nero is tender. divide the kitchari between 2 bowls and top with the greens. Spoon over the pesto and drizzle with the extra virgin olive oil.